It was nearing the end of our time in Alaska, but also the pinnacle of our trip: Seward. Seward is a fishing town surrounded by mountains and full of wildlife. The only thing lacking in this area was quality camping (or any free camping, for that matter). Weeks earlier we had scheduled an excursion to ice climb a glacier with Exit Glacier Guides. Since dogs aren't allowed on the excursion, they recommended a local dog sitter who would take the dogs hiking while we were climbing. The morning of our climb we dropped them off at Seward Dog Lodge and drove to the Exit Glacier Guides headquarters to gear up and meet the people responsible for keeping us alive while we dangled 80 feet above solid ice. We were paired with another couple. Surprisingly, the man was from none other than West Bloomfield, MI. He didn’t know Brooke or the Van Pops but you could tell he and Brooke had that WB connection. The guides, Dakota and ?, helped size us for crampons, harnesses and helmets then drove us in an old white van to the Kenai Fjords National Park where the real adventure began. 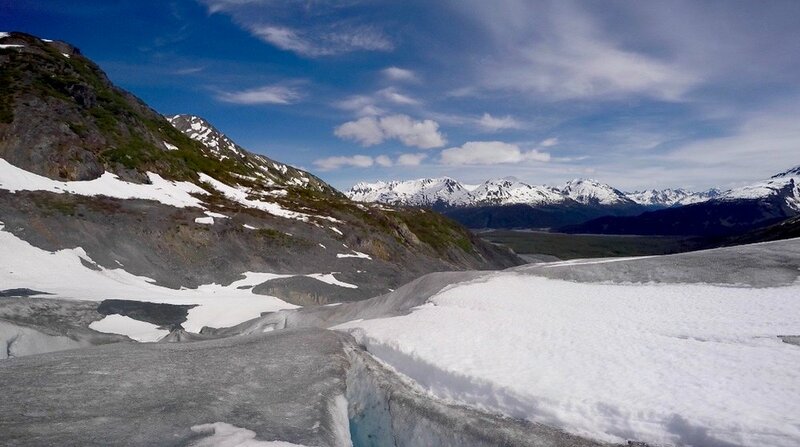 Kenai Fjords is unique because it is kept wild and free of human impact except for one trail that leads to Exit Glacier and Harding Ice Field. The hike was about 2 miles to the glacier where we would find a suitable crevasse to repel down and climb back up. When we finally reached our destination, we geared up in our winter clothes and crampons and walked to the edge of the first crevasse, which was nearly 80 feet deep. Like I mentioned before, to climb up the glacier we first had to repel down. Repelling basically consisted of leaning backwards and trusting in our guides ability to screw stakes into the ice. Brooke and I were naturals. We had no issues repelling down and had basically mastered the ice climbing techniques immediately. I honestly think our guides feared for their jobs because we were so good. 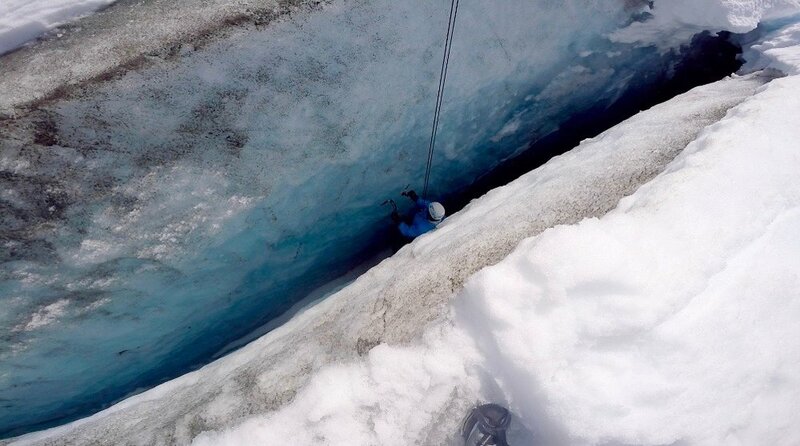 We went to one more crevasse to climb that was so narrow you could hardly fit as it neared the bottom. The crevasses we scaled were amazing. They were every shade of blue, changing with the depth. The walls of ice towering over us really put in perspective the magnitude of these structures. Without a doubt, ice climbing was the highlight of our trip (with the exception of watching sea otters swim in the bay near camp, says Brooke). Thanks Bb, I love you! Once we began our hike back to the van, the countdown until we saw the puppies began. Fortunately, Ms. Heidi sent us pictures of the kiddos running around the beach with their new friends. Thankfully, they were in great condition. That night was our final night, and to celebrate we bought fresh caught Ivory White Salmon - the fanciest (and most expensive) salmon in all the land - and cooked it over a fire with vegetables. It was an amazing last night in Alaska.